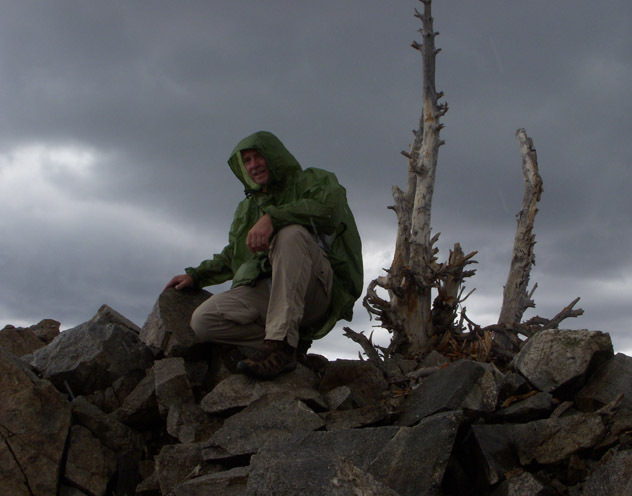 I have been backpacking for over 30 years, all over California, plus many western states and Minnesota. I hike year-round in all weather, and average 500+ miles (800+ km) per year. I make a point of using lightweight gear, and smaller volume packs. Doubting I can ever be truly UL, I try to be as near to it as I can yet still be comfortable. I start early and hike hard so as to enjoy the afternoons exploring/chilling. I usually take a freestanding tent and enjoy hot meals at night. If not hiking solo I am usually with brother-in-law Dave. 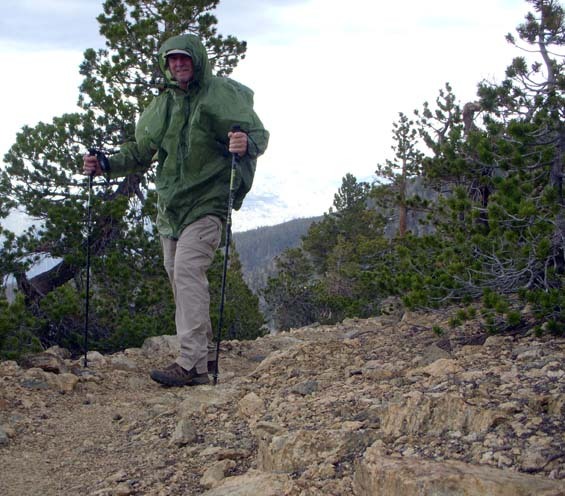 The Cedar Tree Packa (hereafter referred to as the Packa or parka) is a hard shell parka touted as "the world's first full coverage backpacking rain parka". I don't know about that as another company makes something very similar, but the Packa is much nicer. The Packa is made of 33 denier nylon ripstop that has been coated with both silicon and polyurethane, which along with its fully taped seams is said to make it totally waterproof. I am pretty familiar with the material as it is the same as is used on two of my Big Agnes tents. OK, starting at the top. The Packa has a five-panel hood that has a sewn-in piece of flat plastic at the top front to act as a stiff brim. This looks like a pretty good idea from where I sit. Time will tell how it works on the trail. The hood has two side adjustments to snug it up around the face. This is done by pulling down on the two draw strings at the bottom of the hood. As the cord locks that hold the drawcord in place are not tethered this is a two handed operation. The Packa closes by means of a black nylon YKK zipper. 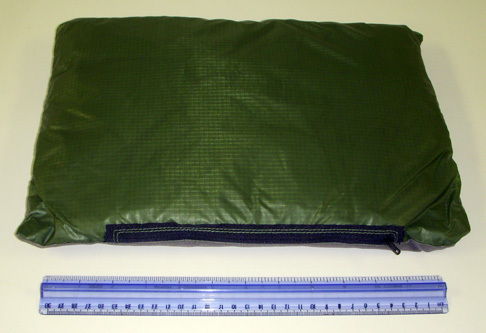 The zipper is covered by a 1.25 in (3 cm) nylon storm flap. It does not have an interior storm guard behind the zipper. At the bottom of the parka is a double ended hem cord that uses non-tethered cord locks to pull the body in tight to cut down on wind blowing the body up. A 7 in (18 cm) apron hangs down in the back of the Packa giving a bit of extra protection. While the information that came with the Packa says that it has Velcro closure sleeves, mine came with draw strings and cord locks identical to those used for the hood and hem. On the right side of the parka is a huge pocket. This mesh backed pocket is the size listed above in the Packed Size line. This is because it is the built in storage as well as being a pocket able to hold a lot of stuff. More than I would want to put in it that is for sure. But as it is fully lined with mesh it also does double duty as extra ventilation as the opening, accessed by a horizontal zipper, is protected from falling rain by a 2.5 in (6 cm) storm flap. Here is a picture of the Packa stored in the now inside-out pocket. Of extreme importance to me, especially in a non-breathable garment like the Packa, are the 16 in (41 cm) long armpit vents, or pit-zips as I refer to them. They use conventional zippers with no storm-flaps. The zippers have a single tab that is closest to my hand in the closed position and down on my side when fully opened. None of the zippers on the Packa have any kind of an extra pull on the tabs. But what makes the Packa stand out from other non-breathable rain coats is the built in pack cover. Bulging out of the back is a cavity that covers a backpack. The company claims that it will fit "even huge external" frame packs. I checked to see just what it will hold. I stuffed one of my biggest winter bags in it to get some accurate measurements. The cavity is 30 in tall, 14 in wide and is 11 in deep (76 x 36 x 28 cm). This gives it a volume of 4620 cu in, or 76 L. Pretty good sized. A draw string at the top is used to cinch the cover section down around the backpack. Here is a picture of it with the cavity completely full. One thing that is pretty cool is the way that the body and arms of the Packa may be folded inside of the pack cover part. The cover may now be placed on the pack in the case of sudden weather. Should the skies open the arms and body can be pulled out from the sides of the covered pack and put on without have to stop or take off the pack. I think this is a great application. The quality of the Packa looks to be top notch. Just about every seam on the parka is double stitched and as claimed is seam taped. I am pretty impressed with it so far. One thing I found interesting is it may be the only garment I have ever owned that did not have any consumer tags inside of it. The only tag on the Packa is a tiny one on the hem near the apron that says "Made in China". The fit is a bit small. I normally buy an XL for the arm length and the Packa is short in the arms for me. But I do not mind wet wrists. The body seems fine at this point. As I almost always carry both a rain coat and a pack cover it will be interesting to see how the combination of the two will free me up. I know right now that it cuts my weight down by 6 oz (170 g). My first outing with the Packa was a doozy. Dave and I went to San Gorgonio Wilderness. We went to Washington Monument and climbed San Bernardino Peak and East San Bernardino Peak, plus spent some time looking for the junction of a long defunct trail. (We never did find it.) We stayed at Limber Pine Bench. The weather was foul the first day with snow and later rain. The next day was nice but cool. It got down to 36 F (2 C) at night and was probably down there when the snow started falling but the Kestrell weather station was under the Packa. I put in 20 miles (32 km) with 5630 ft (1716 m) of elevation gain. We were on dirt, rock, packed drift snow and fresh snow. I carried an Osprey Exos 34 with a starting weight of 25 lb (11.3 kg). I went back to San Gorgonio Wilderness to do some bushwhacking to find an old unmaintained trail. I spent the night at Limber Pine Bench again. It was much warmer this time with no rain. The temps were between 42 F and 67 F (6 to 19 C). I went about 18 mi (29 km) over every kind of terrain from rock to deep pine and oak duff. Next was a two and a half day backpacking trip in Sequoia National Forest in the Sierra Nevada range just south of Mount Langley. The temps ranged from lows of 30 F to highs of 80 F (-1 to 27 C). The high point was 11200 ft (3400 m). This trip saw 59 miles (95 km) with 7340 ft (2240 m) of gain go into the hiking log. In July my kids came to California for a couple weeks and we did an overnight backpacking trip to San Jacinto State Park where we stayed at Round Valley. Here is a picture of the Packa over a 37 L (2260 cu in) pack in the rain. Hiking in California can be a hard place to test rain gear. The lower half of the state (where I live) does not get much in the way of rain during the late spring and summer. But we have these things called mountains here that are high enough to create their own weather, sometimes spectacularly so. My first trip with the Packa was a case in point. The forecast was a pleasant weekend, with no weather. I went to climb two peaks and just as we got to the first I was clobbered with the clouds that I had watched build during the approach. While I was still on the summit I took out the Packa and put it over my Exos 34 pack, stowing the arms, hood and body inside per the manufacturer's suggestion. It looked just like a regular pack cover in this manner. It was of course difficult to access the side pockets of my pack to get my water out. That was OK because not five minutes after heading for the next peak the storm opened up on us and I had all the water I could want. Just like the instructions said, it was very quick and easy to deploy the Packa from body-stowed pack cover to full rain protection. I had not brought rain pants and was therefore pretty pleased with the long back on the Packa that helped keep my hiking pants from getting too wet. By the time I made it to the next summit it started to snow. While it can't be seen well in the picture below, a steady fall of graupel (little ball-like snow that looks like Styrofoam beads) was bouncing off the Packa as I crouched near the summit register. As lightning was moving my way I hurried off the peak and quickly headed back down to where I was making camp for the night. Here is where I needed those huge pit-zips the Packa boasts. That is because being made from non-breathable material my body heat was turning it into a big green sauna. Within minutes I had moisture forming inside the arms. The pit zips were easy to operate while hiking. They helped ventilate my body quite a bit. I later opened the front zipper as much as I could to assist too. But none of it helped my arms, they stayed very wet. The hood works as well as I hoped it would. I have used it over a hat and without to great success. It is easy to adjust and stays in place. While I did not need the Packa for rain on any of the other trips I have used it as a wind breaker in camp in the evenings, or for extra warmth while breaking down camp in the chilly mornings. While a bit baggy, it works fine for this purpose. On the trip with my children my son insisted on using the Packa in pillow-mode as soon as he saw that it was something new. He said that it worked very well. Since he never budged as I climbed over him a few times I will take his word on it. One thing that bugs me is the cord-locks on the cuffs. I find them uncomfortable and may remove them off once the test is over. Since the web site says that the Packa has Velcro cuff closures maybe this is something that is to be addressed in future (or possibly current by now) models. I have split the Packa's time in my pack stowed in its own pocket and loosely stuffed into my pack's outer pocket. To date it is showing no ill effects from the stuffing. Indeed it is showing no signs of wear at all so far. But who knows what the next two months of testing holds in store. As this is the end of this stage of testing won't you please come back to see how the Packa fared? Hey, you're back! Well read on for the conclusion of my test. I used the Packa on an overnight backpacking trip with my children, Emma and Ray. We went to Maplewood State Park in Minnesota where we camped at Cow Lake. The temps ran from 80 F down to 48 F (27 to 9 C) and it only sprinkled a little in the evening. Jenn and I spent three days backpacking in Yosemite National Park. The temperatures ranged from 43 to 80 F (6 to 27 C) and we weathered a violent thunder/snow/hail storm our first afternoon. I went on a solo overnighter to climb Sugarloaf Mountain. The trails started as decomposed granite and turned to thumb sized gravel, then sharp shale. The return loop was mostly on dirt fire control roads. 24 miles (39 km) and 4700 ft (1433 m) of gain carrying a 35 lb (15.9 kg) pack as I had two gallons (7.6 L) of water starting out and some luxury items. Dave and I did an 18 mi (29 km) section of the Pacific Crest Trail (PCT) from Sawmill Campground south to San Francisquito Canyon. It had 3000 ft (915 m) of gain, and a toe numbing 4700 ft (1430 m) of drop in temps that got up to 92 F (33 C) in the shade, which there was not much of. Almost all of the climbing was at the end in the hottest temps and I got a touch of heat exhaustion about three miles (5 km) from the end. This is because we cranked it out pretty fast, finishing in only 6 hours. I carried an Exos 46 loaded with 20 lb (9.1 kg) as I was testing a system for next month's big fall hike and wanted to see how it would carry. I spent two days hiking and another driving/hiking placing water caches for upcoming backpacking trips in the Mohave Desert, Tehachapi and Piute Mountains. It was very hot, over 100 F (38 C) each day. I carried up to 3 � gallons (12 L) of water at a time in the Exos 46 along with my lightest summer gear. Last I "almost" took it on a 79 mi (127 km) backpacking trip in northern California. Read on to see why I did not. The end of summer sees my hiking slow down as more of it is focused on my children. Add to that the lack of foul weather (and the unwillingness to expose them to it) in the areas I take them hiking has led to a lot more carrying the Packa than using it. Well using it on my backa or packa at least. I got to use the Packa to much applause in Yosemite National Park. After Jenn and I had set up the Scarp 2 tent we went to visit other hikers. A fast-developing storm suddenly cut loose. (Exploded was more like it.) First it started dropping the same graupel snow that Dave and I encountered earlier in the test. Then it started raining in earnest. We had all been sitting under the cover of three pine trees and I just pulled the Packa on, tucking it over my legs. When the rain started sluicing through the trees one of the guys said that he had a tarp that we could stay visiting under so I, being armed with the righteous armor of God, I mean knowing the Packa's got my backa, volunteered to jump into the deluge to secure a sheltered area for all of us. As (again) I had not expected that severe of weather I had not brought rain pants. Again the Packa worked very well, with its length and dropping back, to keep me pretty dry down low. I also got to see how it works as a pillow. My son used it one night and I used it one night for this purpose. My son thought it was great, but I needed a bit more support and stuffed some clothes in with it to make it bigger. Being a side-sleeper means my face is on my pillows so I also wrapped it in my T-shirt to keep the nylon off my face. It worked well for me with the modifications. The Packa works well as a pack cover, if my pack fits in it. It sheds any kind of weather Mother Nature has seen fit to throw at me during my test. It has worked as a coat, albeit a very sweat and condensation collecting one, even with the pit zips. But as it stands right now it needs some more work. The Packa is not a comfortable coat to wear by itself. The Quasimodo hump without a pack to fill it up hangs funky and blows around in the wind. The long pit zips are great, but they still can't overcome the fact that I am wearing one of the most waterproof and unbreatheable materials known to man. My forearms are soaked inside within minutes of donning the Packa. I would suggest looking into a material like eVent. This would make the Packa much better as far as comfort goes. The worst thing is the fact that I can't leave my pack protected from rain while I am busy setting up my tent. Once I am separated from my pack only one of us gets to stay dry. And as some of my tents just do not have room to keep the pack inside I like to keep it outside covered to protect it. Well that is fine as long as I have no need to go outside without getting soaked myself. Funny, that situation has never presented itself. I want both, thank you. Also I had a wake-up call on my last trip. I was taking an Osprey Exos 46 pack that I have used with the Packa before. But this time I had to pack it to the brim. I had the extension sleeve deployed and had a Gossamer Gear ThinLight pad wrapped around my tent poles in the back in the pad straps. Right before I left to meet Dave at the trail-head I decided to pull everything out of my pack to put an insulated hydration system in as the weather turned very cold at the last minute. Looking at the Packa I decided to place it on the pack in cover mode just in case it was raining or snowing when we started. Much to my surprise I could not get it over the pack. The pad and poles sitting sideways pulled the opening out and lowered the length it would accept. 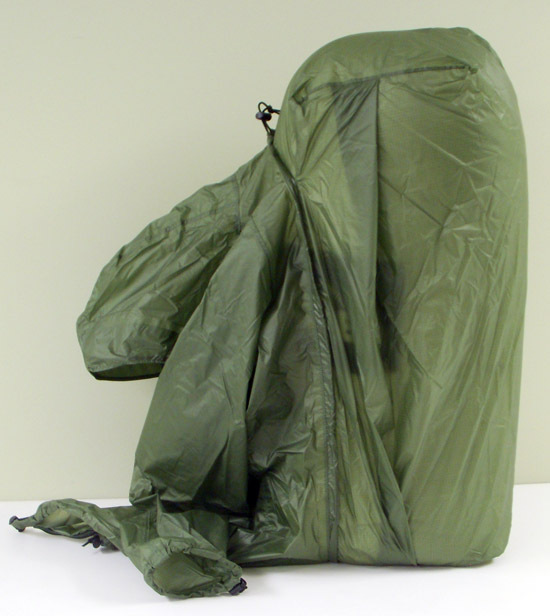 Aaahhh� I threw the Packa in my office and grabbed a traditional rain shell and pack cover. So the theoretical volume of the Packa should be taken with a grain of salt. I will always test it before actually taking on a trip from now on. The Packa is a good idea that has limitations. While it takes the place of two pieces of gear and works OK it does not shine at either. The restriction of not being able to use it for both purposes at the same time while separated from my pack makes it something that I will most likely take on fast-pack or day-hiking trips, not multi-day backpacking trips.